Britain's Mo Farah broke the two-mile indoor world record with a superb run at the Birmingham Indoor Grand Prix. Farah, 31, left the field behind as he stormed home in a time of eight minutes 3.40 seconds - breaking Kenenisa Bekele's previous record of 8:04.34. It is the double Olympic champion's first world record. "This means a lot to me," Farah told BBC Sport. "I love representing my country, giving something back to all the people. Unbelievable." The build-up to Saturday's race had been dominated by a row with Great Britain team-mate Andy Vernon. Farah claimed Vernon had questioned his nationality after the double Olympic champion won European 10,000m gold in 2014, with Vernon describing that as a "huge, huge misrepresentation". The bad feeling clearly did not upset Farah on the track as he dominated the field in Birmingham, leaving Kenyan Paul Koech and American Bernard Lagat trailing as he ran a sub-four minute mile for the second half of the race, clocking 3:59.5. "It's been a difficult week and maybe he was fired up by everything that's gone on. That was Mo Farah at his very best. That was a tough record to beat. Farah ran a sub-four minute second mile. That is a performance that shows he is in great shape and it shows the calibre of the man." "It (the row with Vernon) inspired me, I wanted to do it," said Farah. "Whatever's happened has happened, we've got to move on, but at the same time I'm an athlete, that's what I do best. I just have to keep running." Asked if he had a message for Vernon, Farah said: "No, at the end of the day whatever's done is done. I just have to move on. "I think it's too soon to say anything right now. I've moved on and put that behind me. I want to keep running well." Vernon congratulated Farah on Twitter, saying: "Everything aside that was a cracking run @Mo-Farah. Congratulations on the new WR." Farah, who will skip next month's European Indoor Championships, has five global track titles over 5,000m and 10,000m but had not set a world record until Saturday. "Definitely, it's about setting myself a goal and knowing what I want out of the year," he said. "It's two different things going for a world record or going for a championship. "I shouldn't get carried away, it's only two miles indoors, but at the same time it would be nice to be able to do what I can do for 10k, if I can go close or break it. "But I will never give up (on championships). I want to be able to know I collected as many medals as I could for my country." Mo Farah broke the world indoor record for two miles Saturday at Sainsbury's Indoor Grand Prix in Birmingham, England. Farah pulled away from the pack to finish in 8 minutes, 3.40 seconds, breaking the record of 8:04.35 held by Kenenisa Bekele since 2008. Paul Koetch was a distant second in 8:13.46. Bernard Lagat placed third in 8:17.05. It proved to be a good end to a difficult week for Farah, who trains with the Portland-based Nike Oregon Project. Farah got into a spat on Twitter with fellow British distance runner Andy Vernon over Farah's decision to run in Saturday's two mile against what Vernon apparently considered inadequate competition. 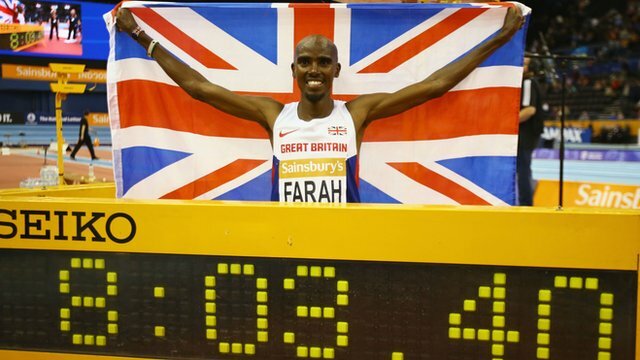 While Farah did overpower the field, he also obviously excelled against the clock. 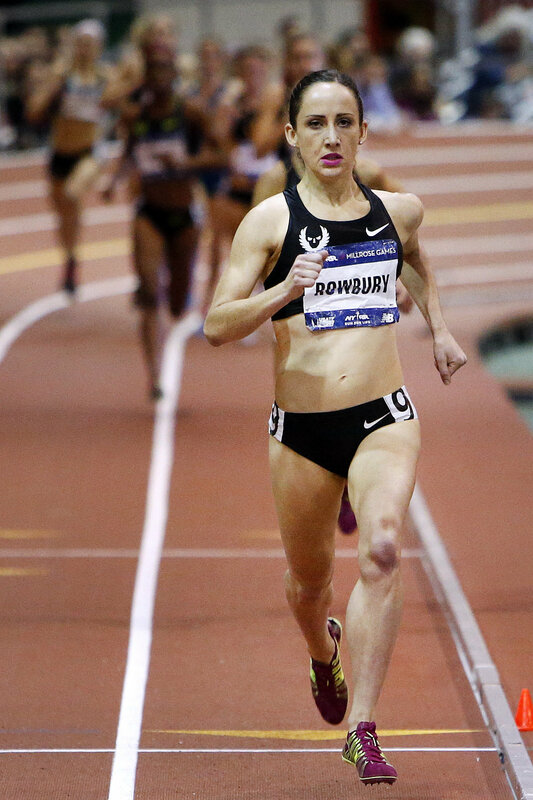 Oregon Project teammates Shannon Rowbury finished second (4:24.12) and Treniere Moser fourth (4:29.18) in the women's mile. Aisha Praught of Oregon Track Club Elite was fifth in 4:32.86. The Oregon Project's Jordan Hasay was third in the women's 3,000 in 8:50.21. Here are complete results of the meet. Farah lists Portland as his primary residence while applying to be a British tax exile.